Showing items in category India, sorted by newest listed first. INDIA - 1932 1a3p purple PSE unused. H&G 14b. 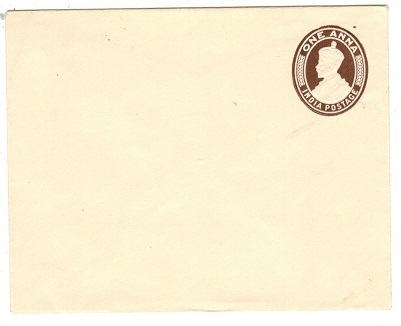 1932 1a3p purple on brownish buff postal stationery envelope (size I) in fine unused condition. H&G 14b. 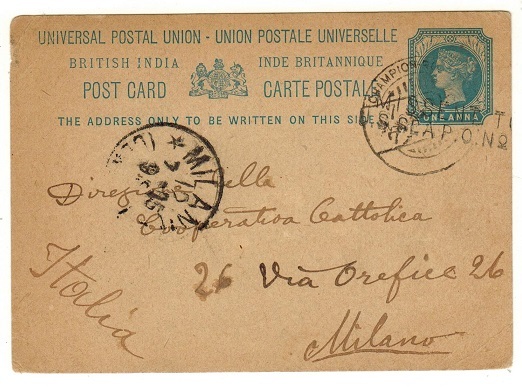 INDIA - 1907 1a carmine PSC unused. H&G 17. 1907 1a carmine on buff postal stationery postcard in fine unused condition. H&G 17. INDIA - 1903 1/4a ultramarine 'ON H.M.S.' India service PSC unused. H&G 8. 1903 1/4a ultramarine on cream 'On H.M.S.' 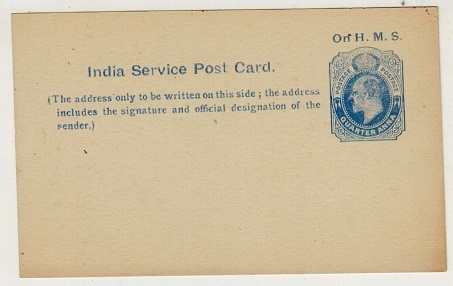 Indian service postal stationery postcard in fine unused condition. H&G 8. INDIA - 1902 1/4a + 1/4a brown PSRC unused. H&G 16. 1902 1/4a + 1/4a brown on buff postal stationery reply postcard in fine unused condition. H&G 16. 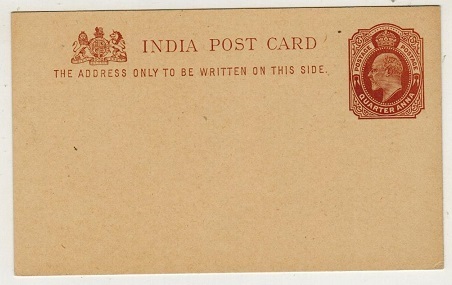 INDIA - 1902 1/4a brown PSC unused. H&G 15. 1902 1/4a brown on buff postal stationery postcard in fine unused condition. H&G 15. INDIA - 1918 1a rate postcard use struck 'DELHI R.M.S./SET 2'. A nice railway use. 1918 (FEB.23.) 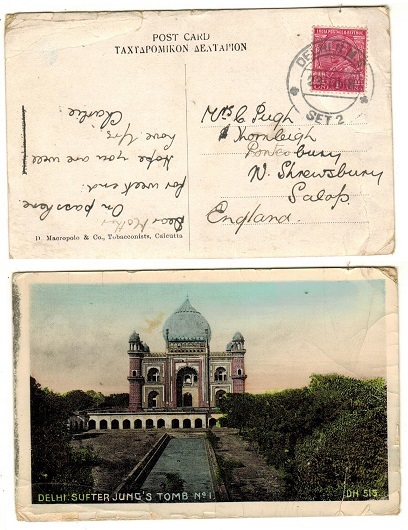 use of picture postcard addressed to UK depicting 'Delhi-Sufter Jungs Tomb' bearing 1a adhesive tied by DELHI R.M.S./SET 2 railway cancellator. INDIA - 1945 'Satara' Internment Camp censor cover to Bombay. 1945 (MAY.5.) 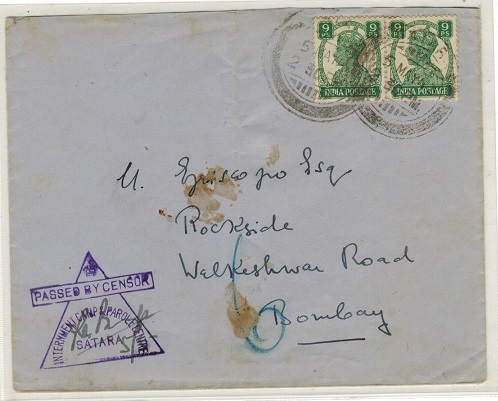 cover addressed to Bombay (ex reverse flap and light central fold) bearing 9ps pair tied SATARA and struck at lower left by violet PASSED BY CENSOR/INTERNMENT CAMP 7 PAROLE CENTRE/SATARA h/s. Little type CC5. Satara was a family internment camp. INDIA - 1879 1 1/2a blue PSC 'INSURED' and registered to Guernsey. Scarce use. H&G 2. 1879 1 1/2a blue on buff postal stationert postcard addressed to Guernsey in Channel Islands (unusual) which remained unstamped but with red on white '161/DILKUSHA' label applied and scarce red on pale yellow INSURED label below. H&G 2. INDIA - 1893 stampless unpaid 'BOMBAY/POSTAGE DUE/1anna' cover. 1893 (NOV.22.) 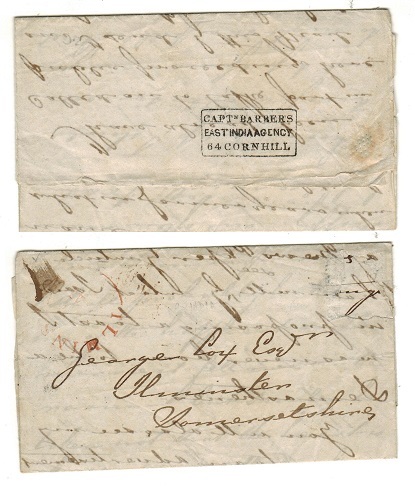 stampless cover addressed locally in native script struck by single ringed BOMBAY/POSTAGE DUE/1 ANNA cancel with neat 'thimble' type NAWA transit and SAMBAR arrival b/s's. Complete with original letter. INDIA - 1935 TELEGRAM envelope cancelled PHONOGRAM. 1935 (JLY.28.) 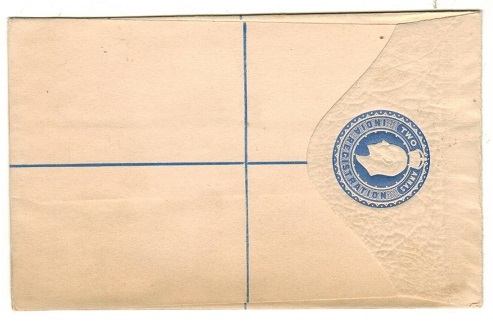 use of stampless (T.I.-56) TELEGRAM envelope handstamped PHONOGRAM in vilet (some surface creasing) cancelled on reverse by INCREASE YOUR/BUSINESS BY USING/ TRUNK TELEPHONES-KARACHI boxed cancel. INDIA - 1943 Italian 'PRISONER OF WAR' postcard from Indian inmate to Cairo. 1943 (5.5.) 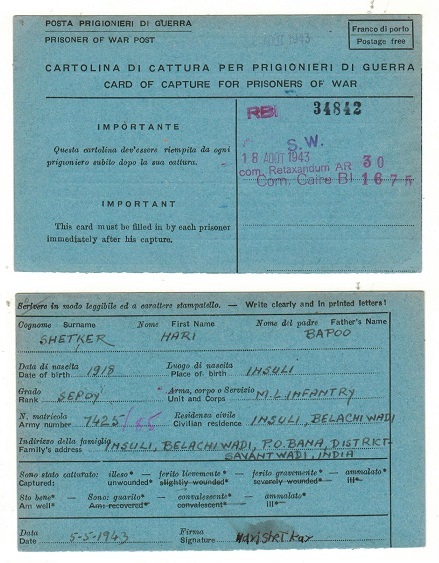 use of black on blue Italian 'PRISONER OF WAR POST' postcard pre-printed POSTAGE FREE addressd to Cairo from an Indian soldier held captured. 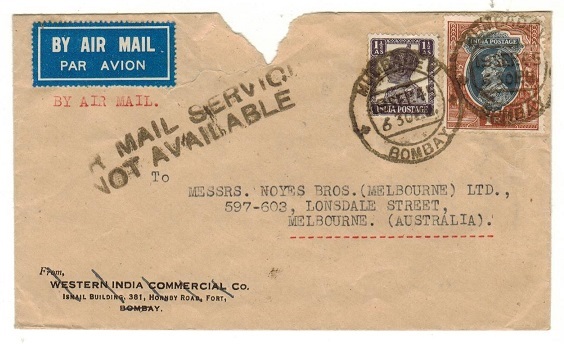 INDIA - 1945 cover to Australia hand stamped 'AIR MAIL SERVICE/NOT AVAILABLE'. 1945 (SEP.19.) 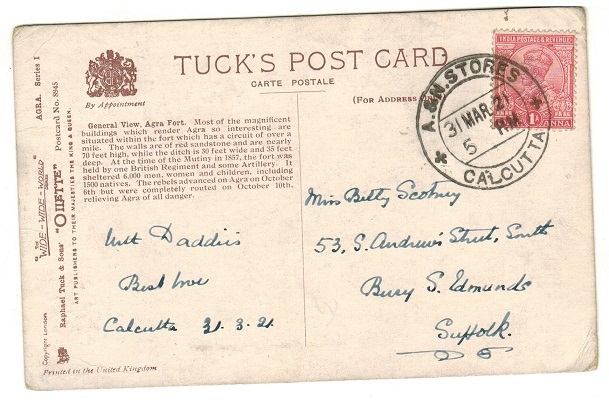 cover addressed to Australia (roughly opened at top edge) bearing 1 1/2a and 1r adhesives tied MUMBADEVI/BOMBAY and struck by scarce black two lined AIR MAIL SERVICE/NOT AVAILABLE. INDIA - 1916 'FIELD SERVICE/INDIA' censored postcard use with BASE OFFICE/H negative seal. 1916 (circa) use of FIELD SERVICE/INDIA (A.F. 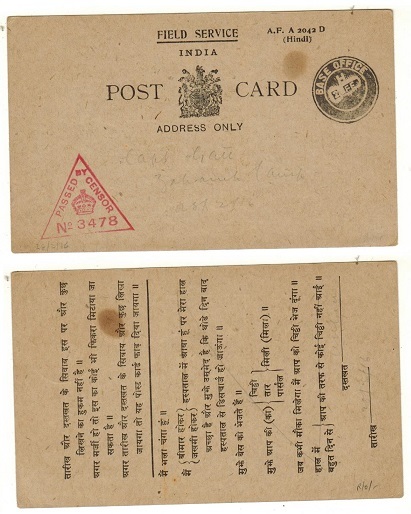 A 2042D/Hindi) official postcard addressed to Captain Gatt in pencil cancelled by scarce BASE OFFICEH 'negative seal' handstamp and with red crowned triangular PASSED BY CENSOR/No.3478 strike at lower left. 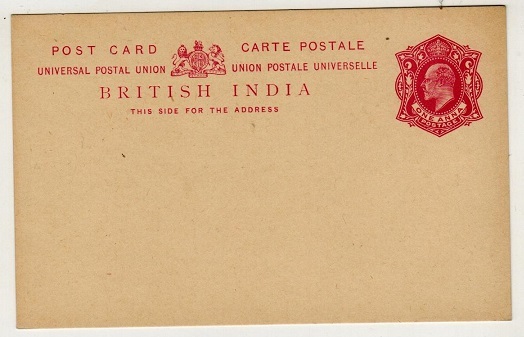 INDIA - 1926 use of 2a blue RPSE to UK at 'CAMP P.O.No. 13L'. 1926 (SEP.17.) 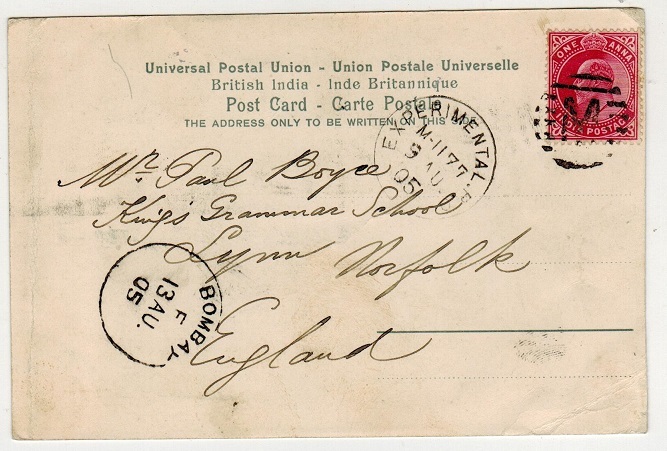 use of 2a blue registered postal stationery envelope (size F) addressed to UK with additional 2a adhesive added and cancelled by CAMP P.O. No.13L cds. INDIA - 1918 'SERVICE OF PRISONER OF WAR' stampless censor cover used at Belgaum Camp. 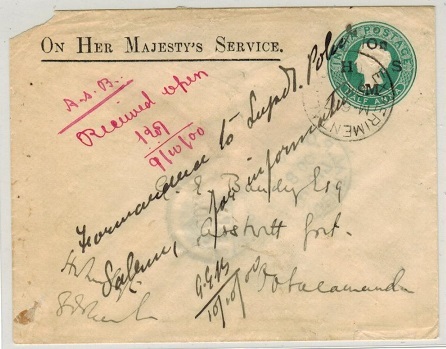 1918 stampless cover addressed to Switzerland struck on the front by black SERVICE OF PRISONERS OF WAR/COLONEL/SUPT.CIVIL CAMP BELGAUM and struck by violet PASSED BT CENSOR 8 circular h/s at left. Red on white crested OPENED BY CENSOR label on reverse cancelled by BERNE arrival. A scarce piece of prisoner mail from this camp set up for women. 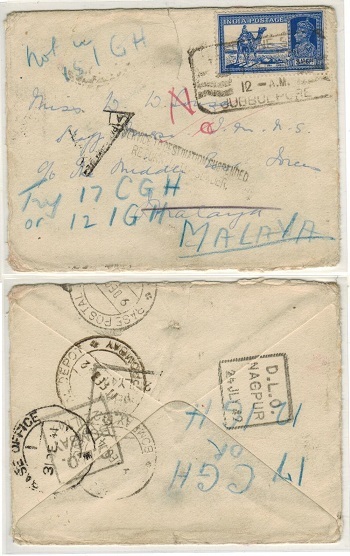 INDIA - 1942 'SERVICE DESTINATION SUSPENDED' cover to Malaya. 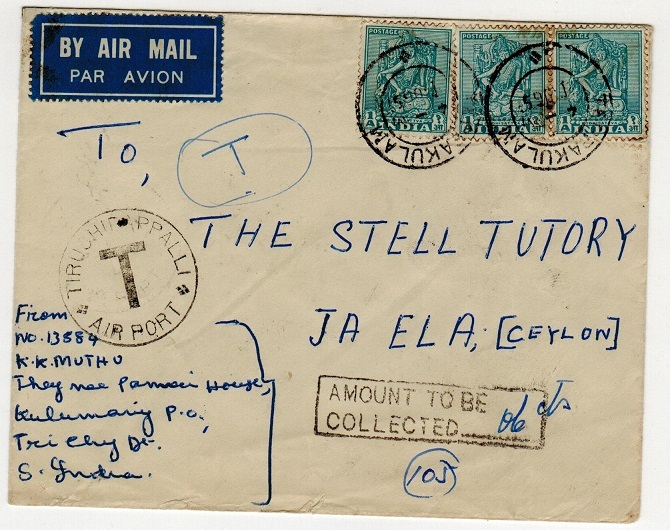 1942 cover addressed to Malaya bearing 3a6p blue tied by JUBBULPORE boxed strike (opened on two sides and with small tear at top edge) struck by part triangular PASSED BY CENSOR strike. The cover was not delivered due to the war and was struck by black two lined SERVICE TO DESTINATION SUSPENDED/RETURN TO SENDER h/s with various b/s' including boxed D.L.O./NAGPUR. INDIA - 1945 4a use of blue 'ACTIVE SERVICE/RAF' privilege envelope to USA. 1945 (4.JUL.) use of scarce blue on cream ACTIVE SERVICE/RAF PRIVILEGE ENVELOPE addressed to USA bearing 4a brown tied by RAF POST cds struck in 'violet' ink. OPENED BY EXAMINER censor label at left tied by black crown octagonal censor strike. INDIA - 1942 1 1/2a local 'V FOR VICTORY' handstamped cover with SUPPORT INDUSTRY cancel. 1942 (NOV.2.) 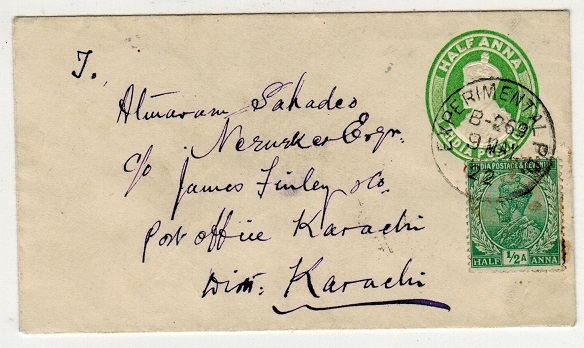 cover addressed locally bearing 1 1/2a adhesive tied by KARACHI GPO-SUPPORT INDIAN INDUSTRY handstamp and struck at left by non official 'V FOR VICTORY' h/s in red. 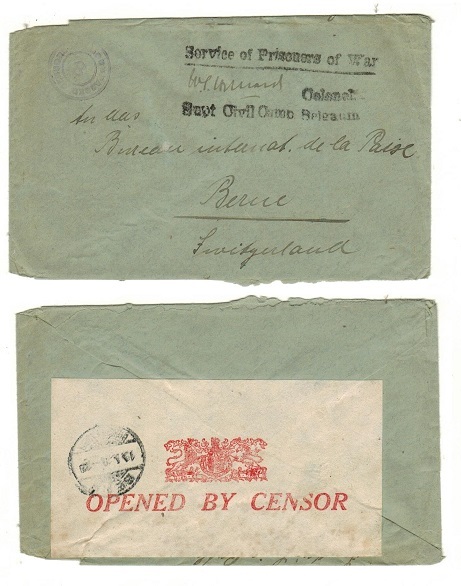 INDIA - 1916 (circa) PRISONER OF WAR LETTER envelope censored to Bohemia. 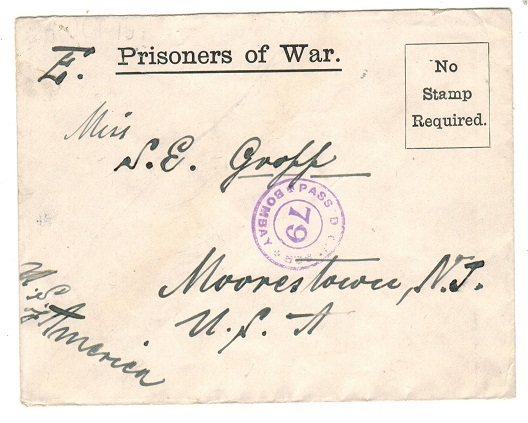 1916 (circa) stampless PRISONER OF WAR LETTER envelope addressed to Bohemia from the Ahmednagar prisoner of war camp struck by violet circular POST FREE/P.C./PRISONER OF WAR handstamp. 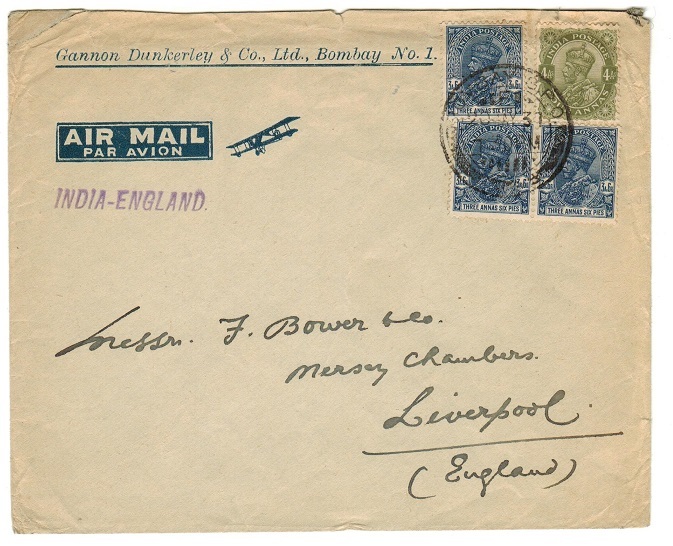 INDIA - 1942 4as brown RAF censored 'Air Mail' PSC to UK used at Calcutta. H&G 4. 1942 4as brown on light cream buff postal stationery 'AirMail' postcard addressed to UK cancelled CALCUTTA and dated 18.AU.42 with violet boxed R.A.F./CENSOR/7 h/s applied. H&G 4. 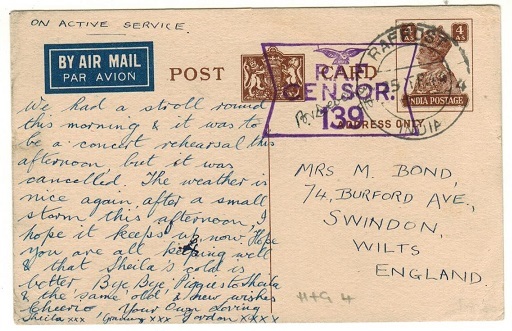 INDIA - 1942 4as brown RAF censored 'Air Mail' PSC to UK struck RAF POST. H&G 4. 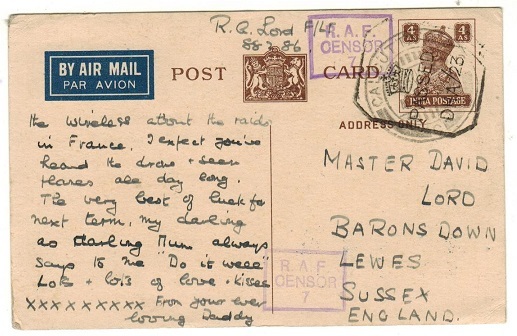 1942 4as brown on light cream buff postal stationery 'AirMail' postcard addressed to UK cancelled RAF/POST/INDIA and dated 25.FE.44 with violet crested RAF/CENSOR/139 h/s applied. H&G 4. INDIA - 1879 9p vermilion 'Soldiers/Seamans' PSE struck STAMP OFFICE/BOMBAY. H&G 1. 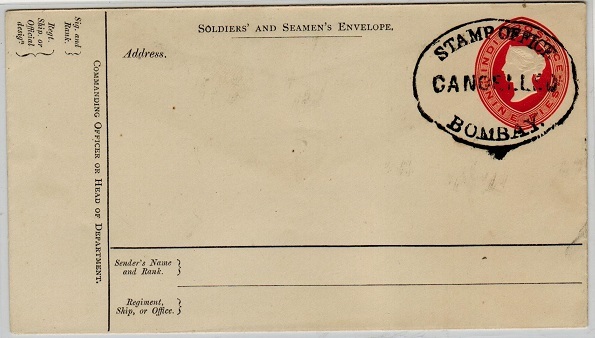 1879 9p vermilion on white 'Soldiers and Seaman's' postal stationery envelope in unused condition handstamped by black oval STAMP OFFICE/CANCELLED/BOMBAY rubber strike. 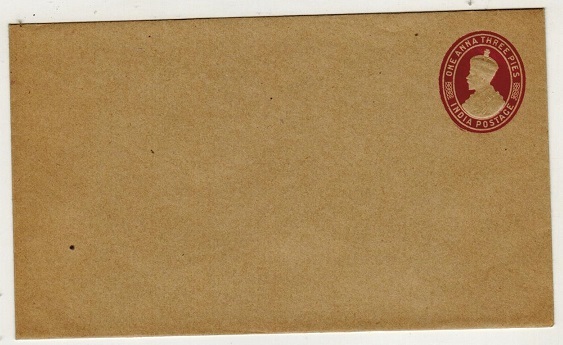 A rare specimen envelope. H&G 1. INDIA - 1908 1a rate postcard use to UK used at SPENCERS BUILDING. 1908 (NO.5.) use of picture postcard addressed to UK depicting 'A toddy Shop' bearing 1a adhesive tied by the scarcer SPENCERS BUILDING cds. Spencers was an early retail chain shop. INDIA - 1951 inward air letter from KUT with scarce 'INTERNAL AIR FACILITY' h/s applied. 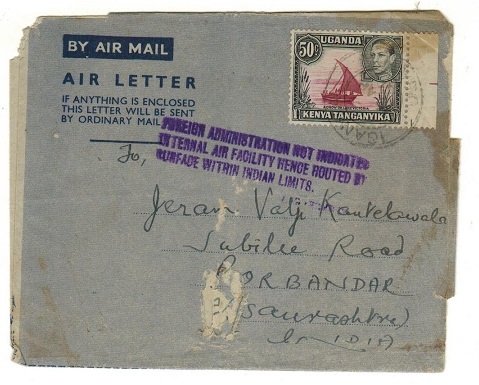 1951 inward dark blue on grey FORMULA air letter from Tanga in Kenya with PORBANDAR box arrival handstamp on reverse and struck on the front by scarce violet three lined FOREIGN ADMINISTRATION NOT INDICATED/INTERNAL AIR FACILITY HENCE ROUTED BY/SURFACE WITHIN INDIAN LIMITS. Scarce. 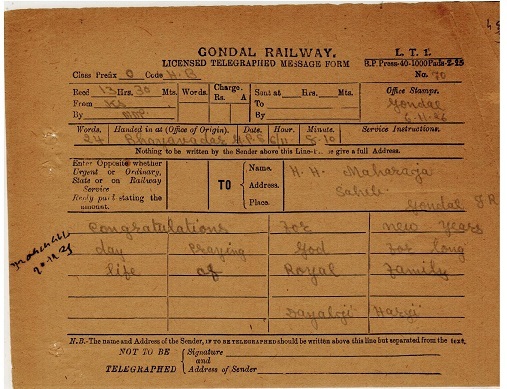 INDIA - 1926 use of 'GONDAL RAILWAY/LICENSED TELEGRAPHED MESSAGE' form. 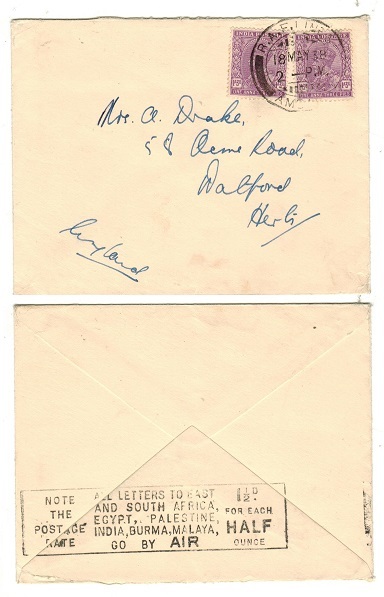 1926 use of black on buff GONDAL RAILWAY/LICENSED TELEGRAPHED MESSAGE form. INDIA (I.E.F.) - 1914 1/2a,1a, 2a6p and 3p adhesives mint (toned) with INVERTED OVERPRINTS. 1914 1/2a light green, 1a carmine, 2a6p ultramarine and 3p orange (SG E2,4,6 and 7) adhesives of India overprinted 'I.E.F.' for the Expeditionary Forces all on toned gum paper (2a6p and 3p with minor corner perf fault) and each having the unlisted OVERPRINT INVERTED variety. INDIA - 1940 3 1/2a rate 'PASSED BY CENSOR 78' cover to USA used at BHIMPORE. 1940 (9.FEB.) cover addressed to USA bearing 1/2a and 3a adhesives tied BHIMPORE and with red on cream PASSED/BY/CENSOR/78 censor label at left. Moreweiser type 10B2 with 'C' added in blue manuscript. INDIA - 1940 3 1/2a rate censored cover to Belgium used at MANEKCHOWK. INDIA - 1928 Calcutta to Rangoon first flight cover by Dutch Aeroplane. 1928 (OCT.4.) 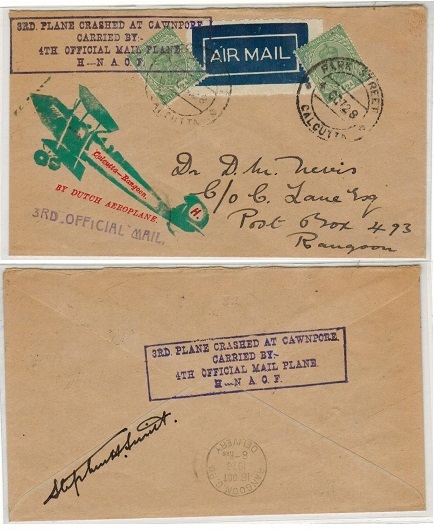 first flight cover addressed to Rangoon bearing 1/2a green (x2) tied by PARK STREET/CALCUTTA cds's. Struck at left by violet boxed 3rd PLANE CRASHED AT CAWNPORT/CARRIED BY/4th OFFICIAL MAIL PLANE/H--N.A.O.F cachet with green (aircraft) handstamp below with red 'Calcutta-Rangoon' insert. Additional strike on reverse and signed 'Stephen Smith'. RANGOON/ DELIVERY b/s dated 16 OCT 28. Only 143 covers carried. INDIA - 1895 1/2a blue green 'ON/H.M.S.' PSE with EXPERIMENTAL/M-617 cancel. 1895 1/2d blue-green on cream postal stationery envelope overprinted 'ON/H.M.S.' in black addressed internally and cancelled by EXPERIMENTAL P.O. cds with 'M-617' coding dated 8.OC.00. H&G 1. INDIA - 1902 2a ultramarine RPSE unused. H&G 2. 1902 2a ultramarine on cream registered postal stationery envelope (size f) in fine unused condition. H&G 2. INDIA - 1948 inward underpaid cover from South Africa with RANDER/DUE/AS h/s applied. 1948 inward under paid cover from South Africa with violet octagonal T/CENTIMES tax mark applied with '60' inserted in manuscript. Struck by 'horse shoe' type RANDER/DUE/AS tax h/s on arrival but the cover was not accepted and was struck by black boxed RETOUR h/s on front. D.L.O. BOMBAY b/s's with black boxed REFUSE/RFUSED instructional strike. INDIA - 1922 1a brown on cream PSE unused. H&G 13. 1922 1a brown on cream postal stationery envelope (size f) in fine unused condition. H&G 13. 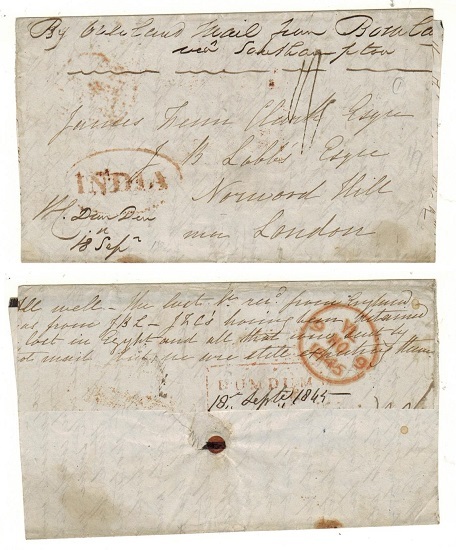 INDIA - 1845 part outer entire to UK with part DUM DUM h/s on reverse. 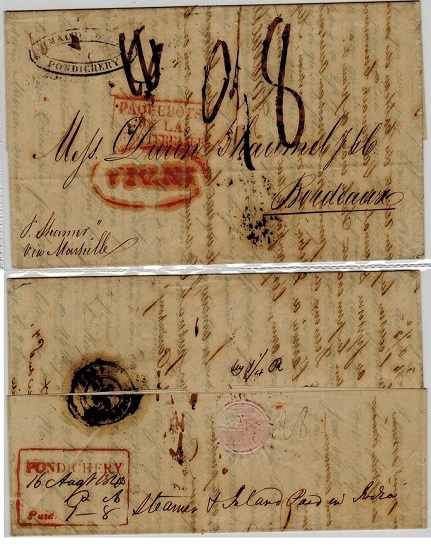 1845 part outer entire addressed to UK marked 'By Overland Mail from Bombay Via Southampton' with red oval INDIA h/s on front and part boxed DUM DUM (Paid) strike on reverse. INDIA - 1872 1a green COURT FEE fine unmounted mint marginal example handstamped CANCELLED. 1872 1a green COURT FEE adhesive in a fine unmounted mint marginal example handstamped CANCELLED in black. Barefoot type 153. INDIA - 1872 4a brown COURT FEE unmounted mint marginal example handstamped CANCELLED. 1872 4a brown COURT FEE adhesive in a fine unmounted mint marginal example handstamped CANCELLED in black. Barefoot type 157. 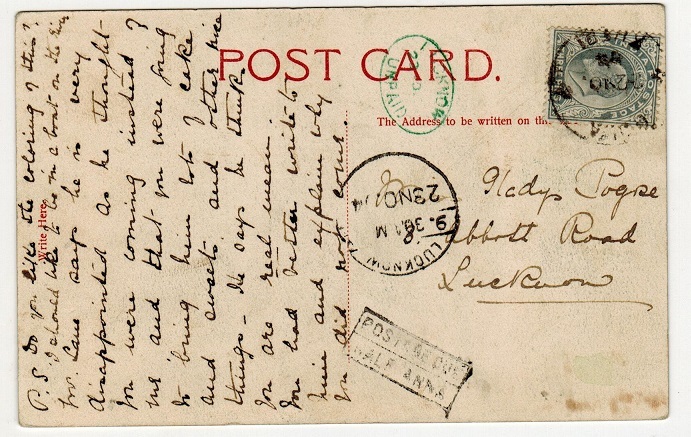 INDIA - 1911 1a rate 'FIRST AERIAL POST' postcard use to UK. 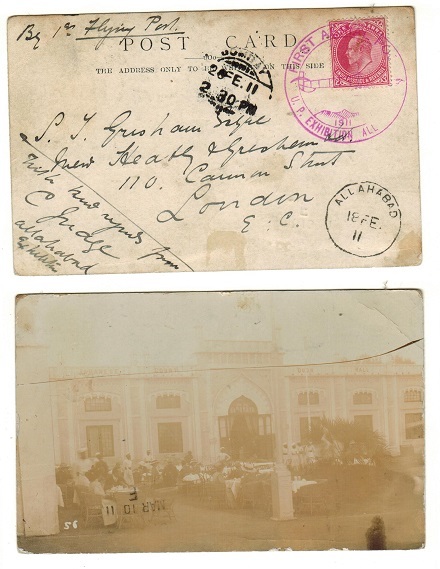 1911 first flight use of real picture postcard addressed to UK depicting 'Japanese Court-Oudh Hall' (people taking afternoon tea) marked 'By 1st Flying Post' and bearing 1a carmine adhesive tied by special illustrated FIRST AERIAL POST.U.P.EXHIBITION ALLAHABAD cancel in violet ink with near ALLAHABAD s/r cds below dated 18.FE.11. Very scarce. INDIA - 1938 2a6p rate cover to UK used at 'R.A.F.LINES'. 1938 (MY.18.) cover addressed to UK bearing 'GV' 1a3p (x2) adhesives tied by scarcer R.A.F.LINES cancel. INDIA - 1921 1a rate postcard use to UK used at 'A & N STORES/CALCUTTA'. 1921 (MAR.31.) 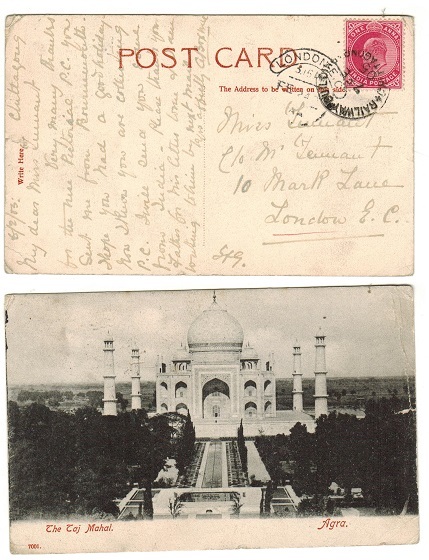 use of picture postcard addressed to UK depicting 'Agra Fort' bearing 1a adhesive tied by d/r 'A & N STORES/CALCUTTA' cds. A scarce 'Army and Navy Stores' cancel. INDIA - 1916 1a rate cover to UK used at BRITISH CAVALRY LINES. 1916 (JUN.2.) 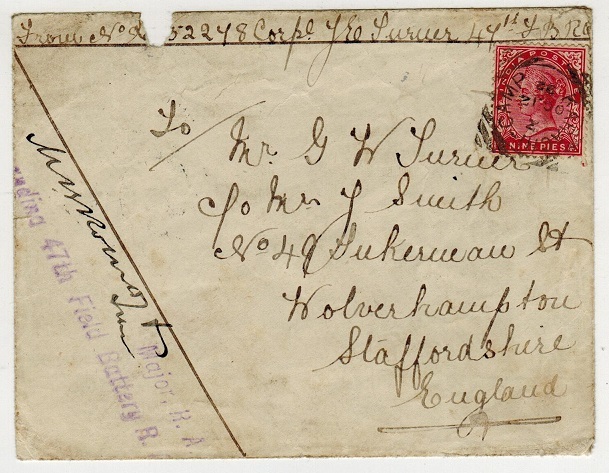 cover addressed to UK (ex part of reverse flap) bearing 1a adhesive tied by scarcer BRITISH CAVALRY LINES cds. INDIA - 1912 1a rate postcard to UK used at MHOW BARRACKS. 1912 (AUG.16.) 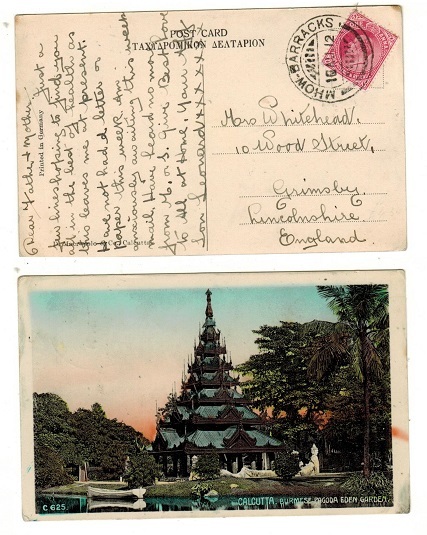 use of postcard addressed to UK depicting 'Calcutta-Burmese Pagoda Eden Garden' bearing Edward VII 1a carmine adhesive tied by superb MHOW BARRACKS cds. Mhow Barracks was a cantonment in Indore. 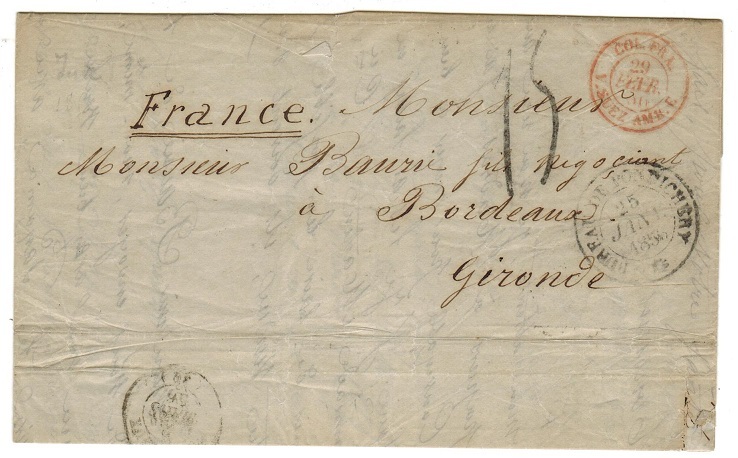 INDIA (Pondicherry) - 1855 stampless wrapper to France with BUREAU DE PONDICHERRY cds. 1855 (DEC.10.) 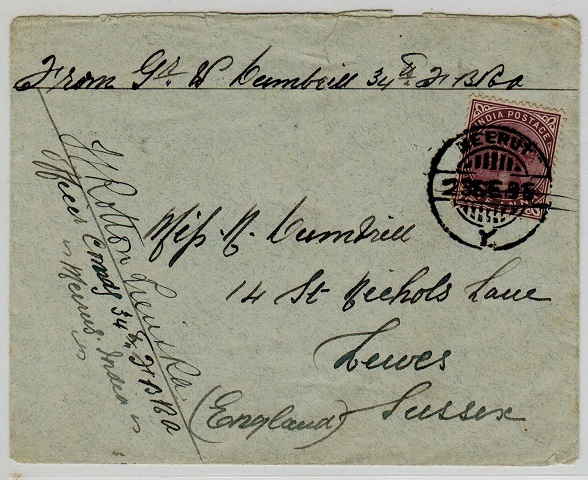 outer stampless wrapper addressed to France marked 'Per Steamer/Via Suez and Marseilles cancelled by BUREAU DE PONDICHERRY cancel with light red boxed 'PD' (Paid) strike at left. Someageing but a nice early piece of mail from this Portugese enclave. 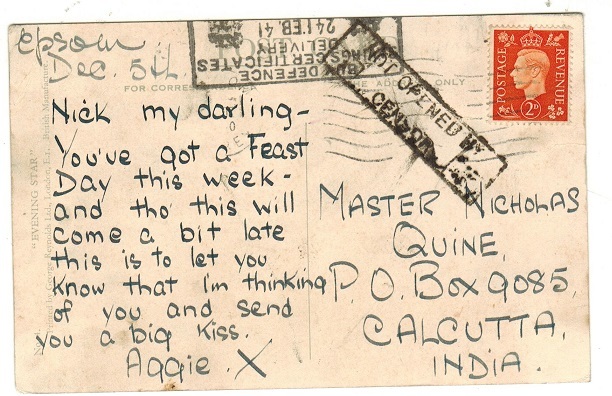 INDIA - 1941 inward postcard from UK with NOT OPENED BY CENSOR h/s. 1941 (FEB.24.) 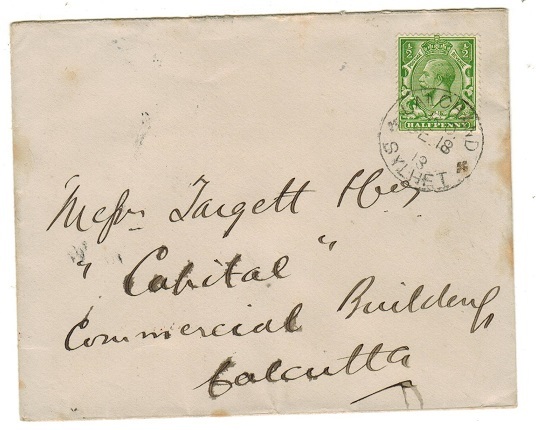 inward postcard from UK to Calcutta struck on arrival by scarce black boxed NOT OPENED BY/CENSOR handstamp. Morenweiser type 8. INDIA - 1894 1a blue PSC to Italy used at CHAMPION REEFS. H&G 11. 1894 1a blue on buff postal stationery postcard addressed to Italy cancelled by CHAMPION REEFS cds dated 7.JL.05 and struck by scarce black two lined MISSENT TO/US.SEA P.O.No. marking. Milano arrival at left. H&G 11. INDIA - 1854 4a indigo and red used 'space filler'. SG 17. 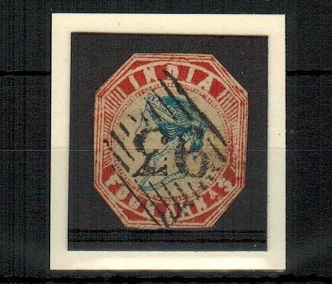 1854 4a indigo and red adhesive (SG type 9) cut to shape (Die 1) and cancelled by '93' grilled cancellator. Small thin on reverse but still a presentable space filler of this high catalogued stamp. SG 17. 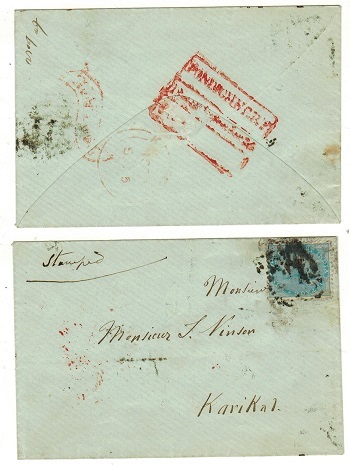 INDIA (Pondicherry) - 1855 local cover to Karikal struck by PONDICHERRY/BEARING h/s in red. 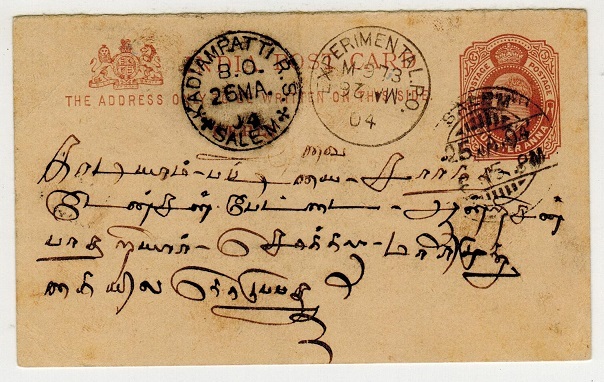 1855 local cover addressed to Karikal bearing 1/2a blue adhesive tied by smudged 'rhomboid' cancelwith curved red INDIA PAID handstamp on reverse side and scarce red boxed PONDICHERRY/ BEARING handstamp. Light KARIKAL arrival in red. A scarce early use from Pondicherry. INDIA - 1903 'SPECIAL ADHESIVE' mint range each handstamped CANCELLED. 1903 1r,2r,3r,4r,5r,7r and 9rs purple 'Government Of India' adhesives in unmounted mint condition (some light colour offset on reverse and 9rs with light crease) each with SPECIAL ADHESIVE printed in green and each handstamped CANCELLED in black. A scarce array. 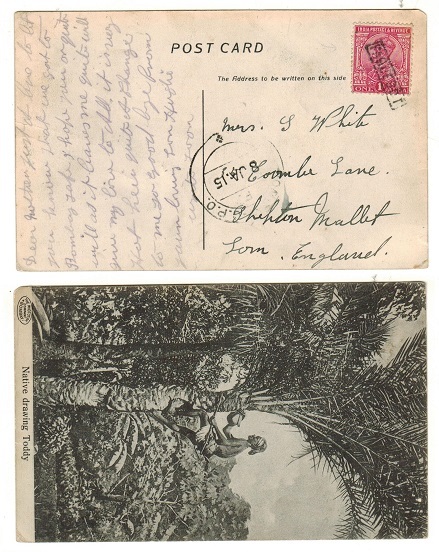 INDIA - 1915 1a postcard use to UK struck PAQUEBOT. 1915 (JA.8.) 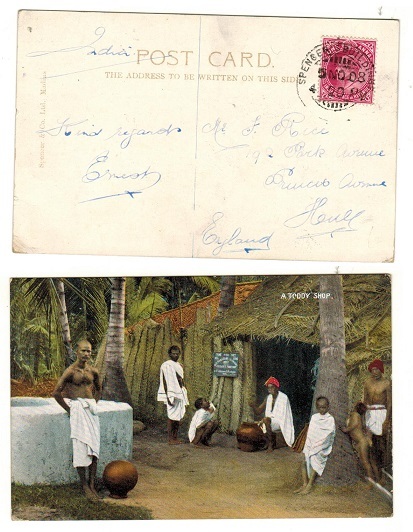 picture postcar5d use to UK depicting 'Native Drawing Toddy' and bearing 1a adhesive tied by PAQUEBOT h/s with BOMBAY/GPO cds at left. INDIA - 1906 4a black on green (incomplete) BOOKLET. SG SB3a. 1906 4a black on green BOOKLET containing two of the original 32 1/2a green adhesives. A scarce booklet. SG SB3a. INDIA - 1852 1/2a white 'SIND DAWK' cancelled by 'diamond of dots' cancel. SG S1. 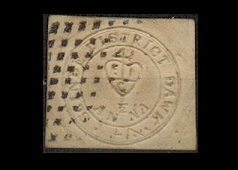 1852 1/2a white 'Sind Dawk' embossed issue printed under the authority of Sir Bartle Frere the Commissioner of Sind cut square and cancelled by a diamond of dots. SG S1. INDIA (Pondicherry) - 1871 'PONDICHERRY 111' entire to Madras bearing Indian 1/2a blue. 1871 (JL.31.) entire addressed locally to Madras bearing 1/2a blue adhesive tied by '111' numeral cancel with PONDICHERRY cds at left. Red unframed MADRAS/DELIVERY arrival b/s dated 1871/AU.1./3. (Minor age faults). A scarce use from this Ex French territory. INDIA (Pondicherry) - 1863 'PONDICHERRY 111' entire to Mauritius bearing Indian 2a orange pair. 1863 (MY.4.) entire addressed to Mauritius marked in manuscript 'Via Madras & Gali' bearing Indian 2a orange pair tied by PONDICHERRY cds with '111' boxed numeral strike alongside. Struck on the front by two red crescent INDIA PAID handstamps and with red PONDICHERRY double arc b/s, MADRAs transit and thimble type MAURITIUS arrival dated JY.29.63. A scarce use from this French settlement. INDIA (Pondicherry) - 1863 'BUREAU DE PONDICHERRY' entire to France. 1863 (DEC.24.) 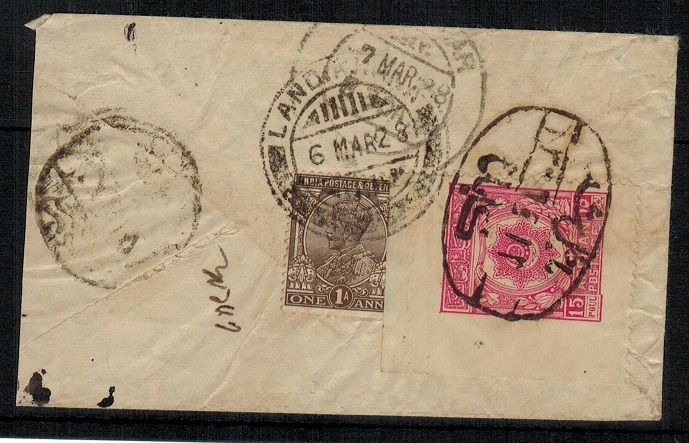 stampless entire addressed to France marked 'Via Suez' and cancelled by fine d/r BUREAU DE PONDICHERRY cancel in black with red boxed 'PD' (Paid) h/s alongside. INDIA (Pondicherry) - 1858 'BUREAU DE PONDICHERRY' entire to France. 1858 (JAN.25.) 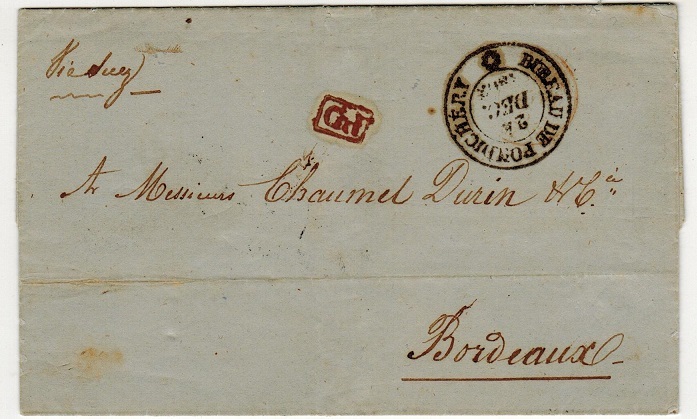 stampless entire addressed to Bordeaux cancelled by BUREAU DE PONDICHERRY d/r cds with red d/r COL.FRA/V.SUEZ AM.R.E. strike above. Struck by '15' rate mark. 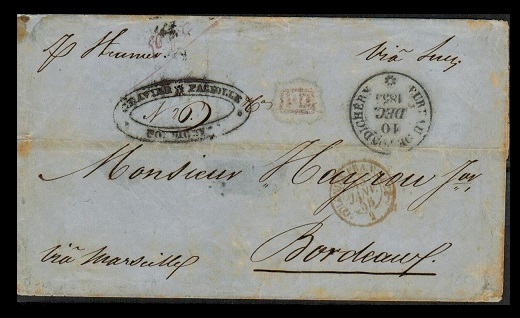 INDIA (Pondicherry) - 1840 1r8a rate 'PONDICHERRY PAID' entire to France. 1840 (AUG.16.) entire addressed to France sent via the British P.O. and rated 1r8a (to Marseilles) and charged at 8c onwards to Bordeaux. The cover is struck by red INDIA oval h/s and with French framed PAQUEBOTS DE LA MEDITERRANEE h/s in red. Struck by rare framed PONDICHERRY/PAID h/s on reverse side. Small facial tear on front otherwise a fine and rare early cover from Pondicherry. 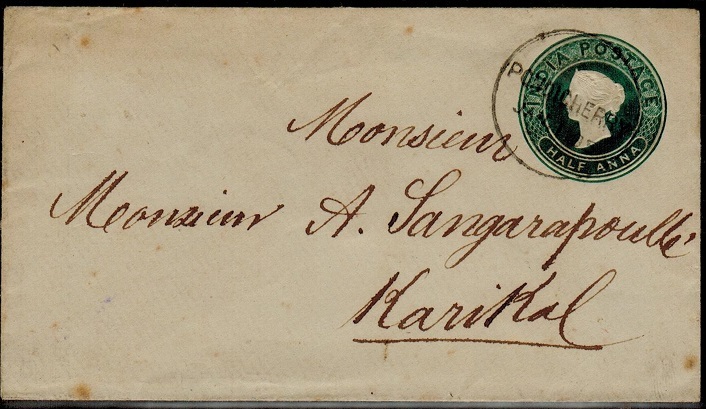 INDIA (Pondicherry) - 1883 1/2a green PSE of India used at PONDICHERRY. H&G 4. 1883 1/2a green on white postal stationery envelope (size c) addressed to Karikal and cancelled by scarce s/r PONDICHERRY cds dated JAN.1.85. A scarce use of this envelope from Pondicherry. H&G 4. INDIA - 1905 1a postcard use to UK used at RAILWAY BUILDING CHITTAGONG. 1905 (FE.7.) use of picture postcard addressed to UK depicting 'Taj Mahal' bearing 1a adhesive tied by RAILWAY BUILDING CHITTAGONG cds. INDIA - 1952 4a orange 'Healthy India' adhesive on local cover used at SECUNDERBAD. 1952 (JAN.3.) cover addressed locally bearing the unissued 4a orange 'Healthy India' TRIAL adhesive tied by d/r SECUNDERABAD cds. Unusual use. INDIA - 1918 1a rate 'PASSED BY CENSOR/28/BOMBAY' postcard to Sweden. 1918 (22.7.) 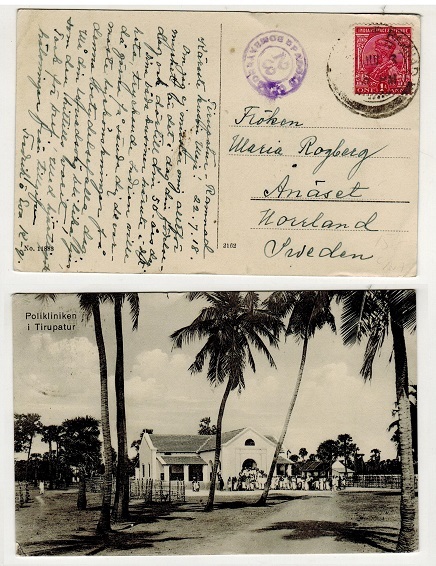 use of picture postcard addressed to Sweden (unusual) depicting 'Polikliniken I Tirupatur' bearing 1a adhesive tied TIRUPATURI RAMNAD and with violet circular PASSED CENSOR/28/BOMBAY h/s at left. 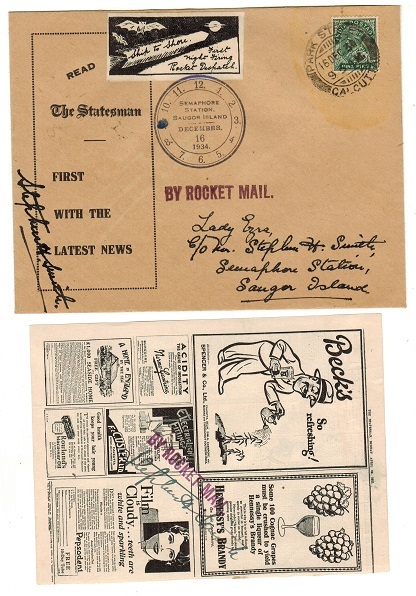 INDIA - 1934 'The Statesman' first flight rocket mail cover with contents. 1934 (DEC.16.) first night firing rocket despatch cover 'Ship to Shore' bearing 9p green adhesive tied by PARK STREET/CALCUTTA cds and with special SEMAPHORE/STATION/SAUGOR ISLAND commemoration handstamp cancelling black on white ROCKET DESPATCH label. Complete with the original contents 'The Statesman News' handstamped in violet BY ROCKET MAIL. Both signed by Stephen Smith. Only 150 flown. INDIA - 1951 9p green 'Ghandi' illustrated PSC unused. H&G 65b. 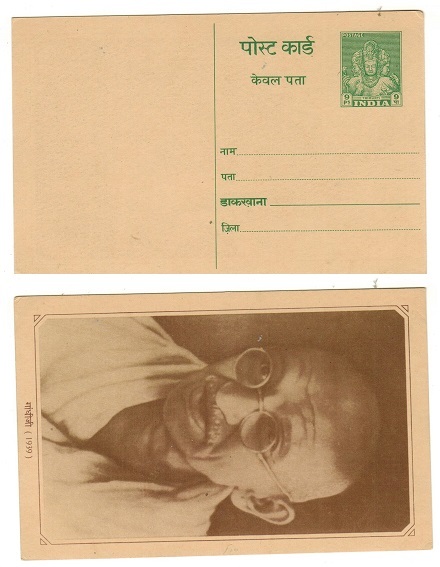 1951 9p bright green on cream postal stationery postcard in fine unused condition depicting a greyish portrait of Ghandi Spinning on reverse dated (1942). H&G 65b. INDIA - 1951 9p green 'Ghandi' illustrated PSC unused. H&G 65. 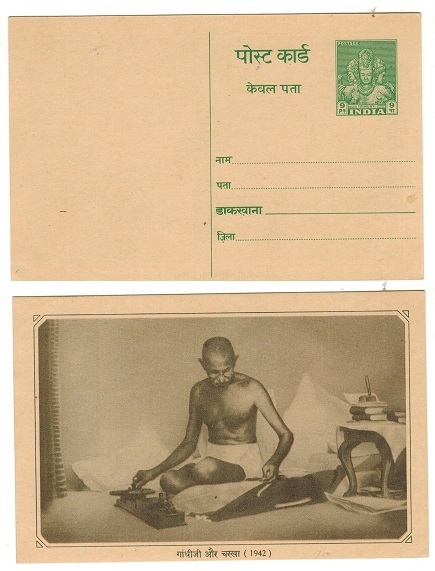 1951 9p bright green on cream postal stationery postcard in fine unused condition depicting a brown portrait of Ghandi on reverse dated (1939). H&G 65. INDIA - 1938 'Imperial Airways' flight cover to UK with GB 6d adhesive tied BOMBAY FOREIGN/PAQUEBOT. 1938 (JAN.21.) 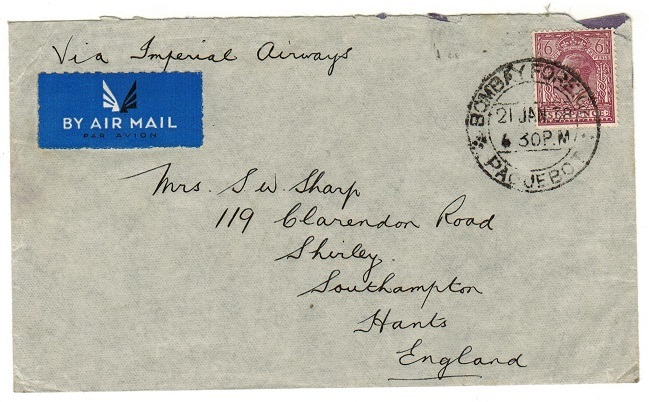 cover addressed to UK marked 'Via Imperial Airways' and bearing GB 6d adhesive tied by BOMBAY FOREIGN/PAQUEBOT cds. INDIA - 1945 FORCES MAIL/VICTORY GREETINGS air letter unused. 1945 blue on cream FORCES MAIL/VICTORY GREETINGS air letter in unused condition pre-printed FOREIGN/POSTAGE/FREE with G.P.C.-G/2002-5-12.45-4,30,400 copies imprint on flap edge and with lovely coloured VICTORY GREETINGS/FATEH.KI.MUBARIK interior depicting various Indian soldiers. 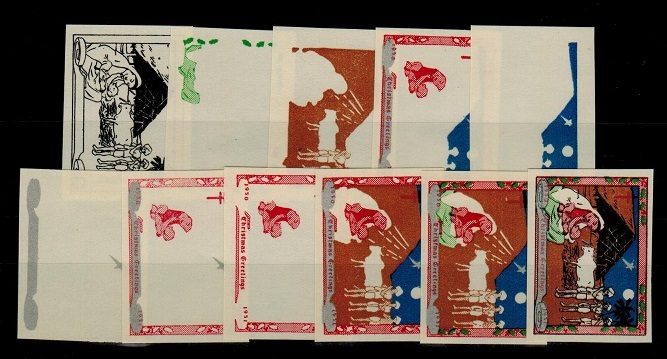 INDIA - 1951 'TB-CHRISTMAS GREETINGS' PROOF labels showing various stages of printing. 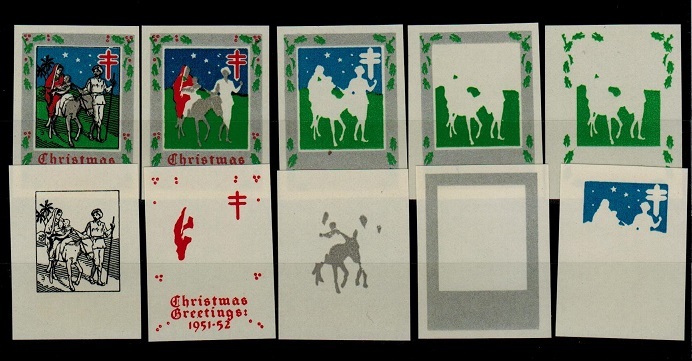 1951 'TB - Christmas Greetings' label range of 10 proof examples showing the completed label (imperforate) together with a further 9 examples showing various stages of the printing including frame only, vignette only (different colours) etc. A most unusual series of 10 proofs. INDIA - 1950 'TB-CHRISTMAS GREETINGS' PROOF labels showing various stages of printing. 1950 'TB - Christmas Greetings' label range of 11 proof examples showing the completed label (imperforate) together with a further 10 examples showing various stages of the printing including frame only, vignette only (different colours) etc. A most unusual series of 11 proofs. INDIA - 1947 1/2a violet surcharge on 9ps green PSRC uprated to USA at LAHORE. H&G 57. 1947 HALF ANNA in violet surcharge on outward section of the 9ps+9ps green on cream postal stationery reply postcard addressed to USA and uprated with additional 2as adhesive and tied by weak GPO/LAHORE cds dated 3.MAR.47. H&G 57. INDIA - 1947 1/2a black surcharge on 9ps green PSC used with LATE FEE/NOT PAID h/s applied. H&G 56. 1947 1/2a black on 9p green on cream postal stationery postcard addressed locally & SET-1 (TPO) marking & oval LATE FEE/DETAINED/NOT PAID h/s. H&G 56. 1928 (MAR.6.) small sized cover addressed in local script bearing Indian 1a brown adhesive with 15 poul pink-red Afghan adhesive partly overlayed from the top right corner cancelled by LANDIKANA cds and oval Afghanistan strike. A scarce combination cover. 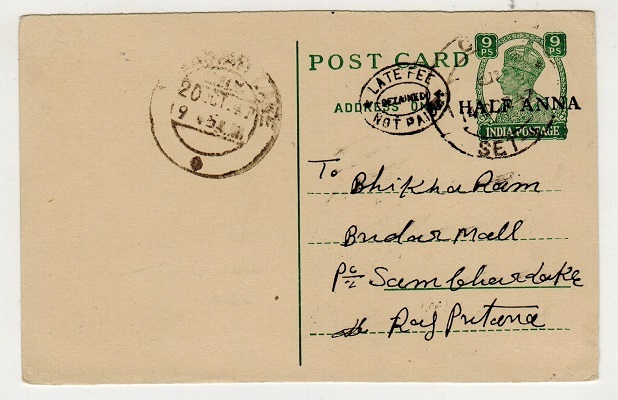 INDIA - 1946 'Book Post' cover to Ireland struck INSUFFICIENTLY PREPAID at BOMBAY. 1946 (AUG.31.) 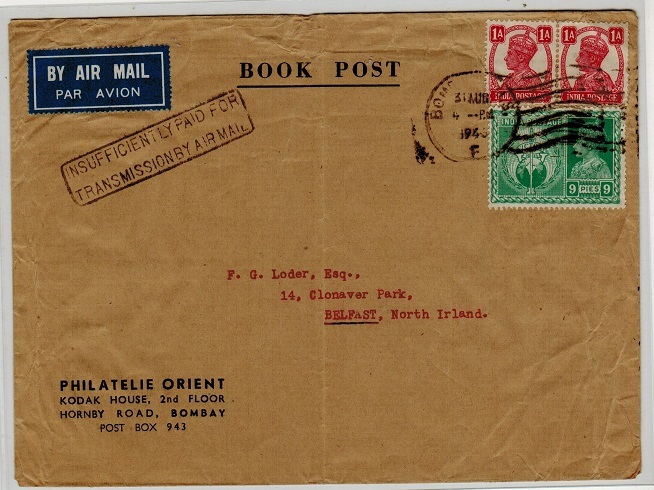 'BOOK POST' cover addressed to Ireland (central fold) bearing 1a pair and 9p 'Victory' adhesive tied by BOMBAY roller strike and struck at left by black boxed INSUFFICIENTLY PREPAID FOR/TRANSMISSION BY AIR MAIL handstamp. 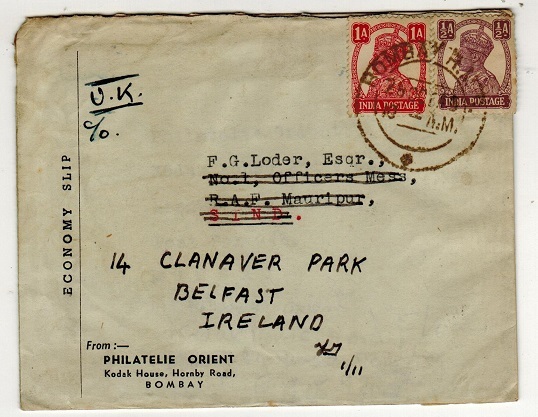 INDIA - 1945 'Economy Slip' cover to Ireland used at BOMBAY R.M.S. 1945 (OC.26.) 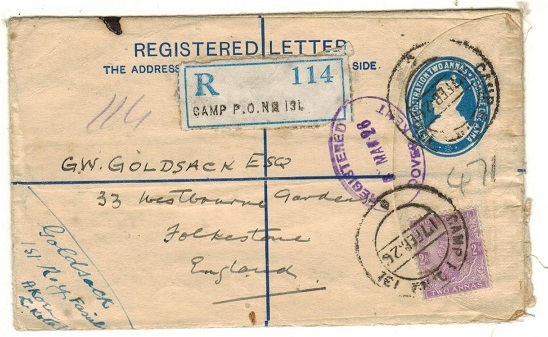 cover addressed to Ireland bearing 1/2a and 1a adhesive tied by BOMBAY R.M.S. cds with the stamps and address being applied to ECONOMY SLIP label in order save paper. INDIA - 1913 local cover with 'GB' 1/2d adhesive used at LALCHAND SYLHET. An unusual use. 1913 (SE.18.) cover addressed locally to Calcutta bearing GB 'GV' 1/2d green adhesive tied by s/r LALCHAND SYLHET cds and with CALCUTTA arrival b/s. A scarce use of this GB adhesive from what became Bangaladesh. 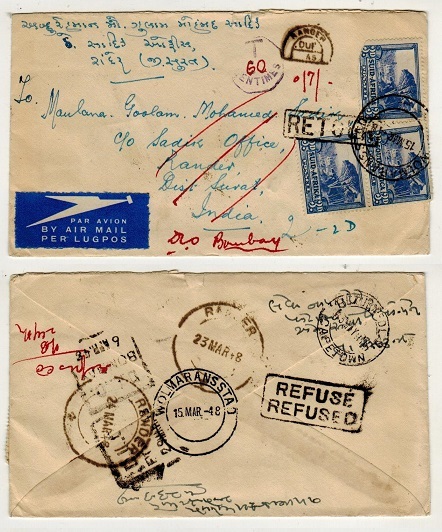 INDIA - 1935 first flight ROCKET MAIL from Dhakuria. 1935 (FEB.27.) 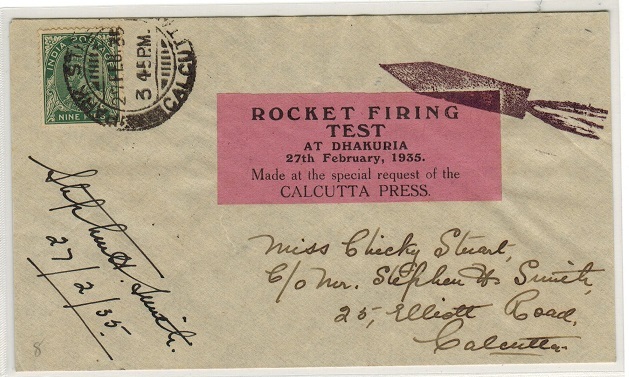 ROCKET FIRING TEST/AT DHAKURIA cover addressed to Calcutta bearing 9p green tied PARK STREET/CALCUTTA with special black on pink Calcutta Press commemoration vignette at right tied by violet 'rocket' handstamp. Signed by Stephen Smith on the front. Only 130 flown. INDIA - 1934 first flight ROCKET MAIL cover from Saugor Island. 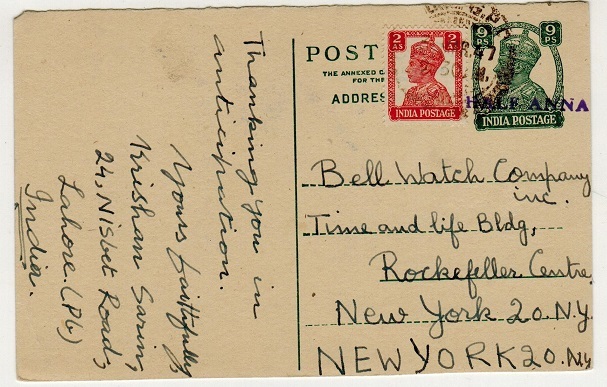 1934 (DEC.16) first night firing 'Rocket Mail' envelope addressed to Sangos Island bearing 9p green tied PARK STREET/CALCUTTA with speical violet boxed LIGHTHOUSE/SAUGOR ISLAND/16-12-1934 h/s and magenta s/l BY ROCKET MAIL strike. Only 150 items sent. Scarce. 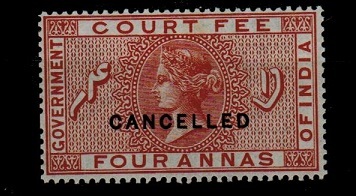 INDIA - 1923 2a to R1 'AGREEMENT' revenues in blocks of four struck CANCELLED. 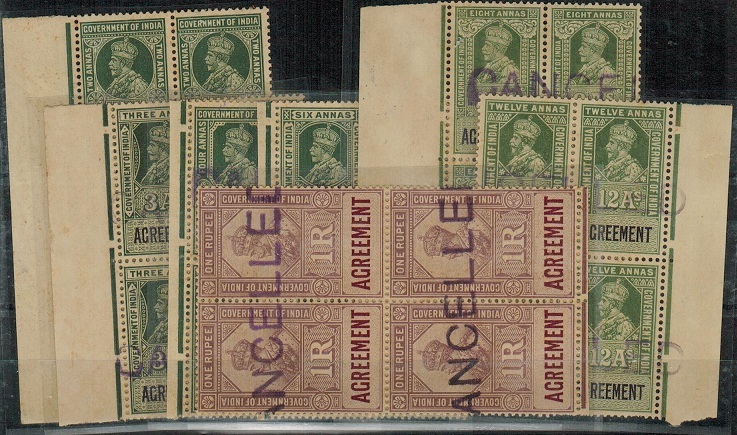 1923 2a to R1 green 'Government of India' AGREEMENT official adhesives (Barefoot 1-7) each in mint blocks of four (brown gum) and each struck by violet CANCELLED rubber handstamps. Some minor (light) paper adhesion in a few places but a scarce set as such in multiples. (7 blocks). INDIA - 1850 (circa) entire to UK (stamp removed) with 'CAPT BARBERS' East India Agency h/s. 1850 (circa) entire address to Ilminster in UK (stamp removed) but with fine black boxed CAPT. BARBERS/EAST INDIA AGENCY/64 CORN HILL forwarding agency b/s. INDIA - 1928 'Doisy and Carol' first flight cover to Rangoon. 1928 (MAY.4.) 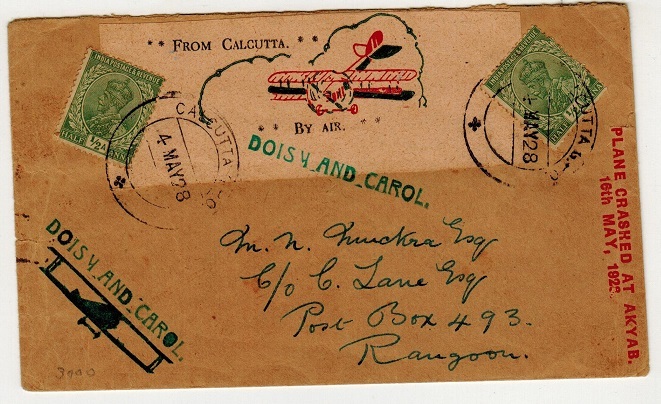 first flight cover addressed to Rangoon in Burma bearing 1/2a (x2) tied by CALCUTTA GPO cds's with red, green and black on pink FROM CALCUTTA/BY AIR label at top tied by green DOISY AND CAROL s/l handstamp. A further strike at lower left with air craft below and with red PLANE CRASHED AT AKYAB/16th MAY 1928 h/s at right. CONSULAR GENERAL DE FRANCE/CALCUTTA violet 'seal' type b/s. A scarce flight. INDIA - 1941 'V for VICTORY' patriotic label cover to Bombay. 1941 (SEP.22.) 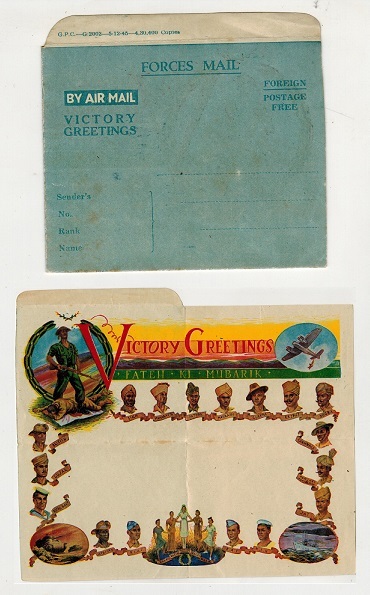 cover addressed locally to Bombay bearing 3a6p blue adhesive tied by KARACKI CITY roller type cancel and with rare red on mustard 'V/FOR VICTORY' patriotic label tied together with crested OPENED BY CENSOR label by violet triangular PASSED/BY/CENSOR/14 h/s. INDIA - 1935 '5th Sikkim' Silver Jubilee rocket flight cover. 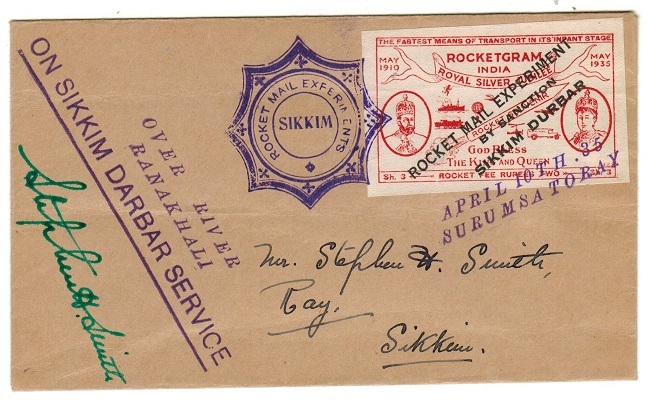 1935 cover addressed locally to Stephen Smith at Sikkim bearing a copy of the red on white 3 SH -Rocket Fee 2 rupees-ROCKETGRAM INDIA/ROYAL SILVER JUBILEE imperforated label tied by violet ROCKET MAIL EXPERIMENTS/SIKKIM cachet and APRIL 10th 35/SURUMSA TO RAY h/s. The label is overprinted ROCKET MAIL EXPERIMENT/BY SANCTION/ SIKKIM DURBAR and the cover is struck by OVER RIVER/RANAKHALI/ON SIKKIM DARBAR SERVICE h/s and is signed by Stephen Smith in green ink on front and black ink on reverse. INDIA - 1937 cover to UK struck by INDIA-ENGLAND violet transmission handstamp. 1937 (MAY.20.) 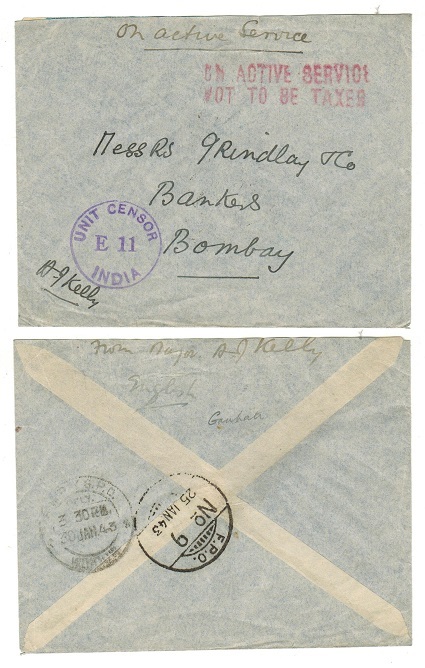 cover addressed to UK bearing 3a6p (x3) and 4a adhesives tied by BOMBAY/GPO cds and struck at left by violet INDIA-ENGLAND transmission h/s. 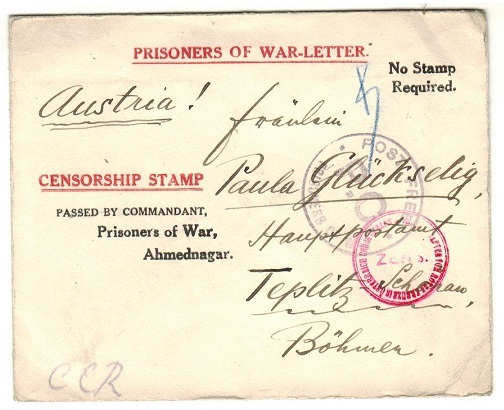 INDIA - 1917 PRISONER OF WAR censored envelope to USA from a POW inmate at Ahmednagar Camp. 1917 (circa) use of PRISONER OF WAR pre-printed envelope addressed to USA struck by violet circular PASSED BY CENSOR/79/BOMBAY handstamp. This coming from a prisoner 'Th Rabus' held at the Office Camp at Ahmednagar in India during the first world war. Unusual to USA. INDIA - 1943 NOT TO BE TAXED 'O.A.S.' censor cover to Bombay used at FPO/No.9. 1943 (JAN.25.) 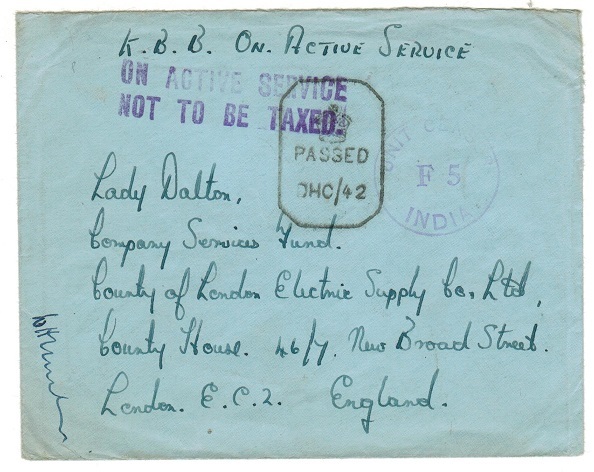 stampless 'On Active Service' cover addressed to Bombay struck on the front by ON ACTIVE SERVICE/NOT TO BE TAXED instructional h/s (Proud type F1) struck in red ink with circular violet UNIT CENSOR/E11/INDIA strike and FPO/No.9 b/s used by troops at Gauhati. INDIA - 1917 2a6p rate 'PASSED CENSOR 22/BOMBAY' cover to Iran with scarce VIA MOHAMERAH h/s. 1917 (FE.8.) 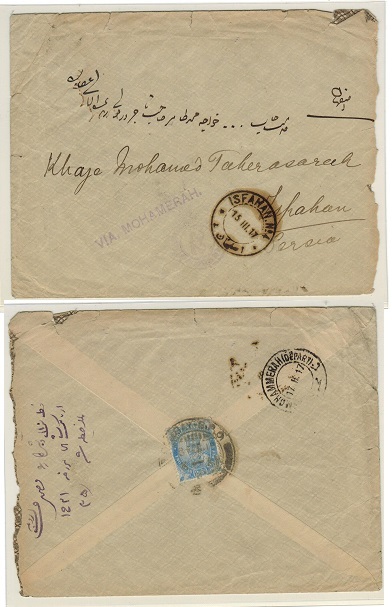 cover addressed to Iran bearing 2a6p blue adhesive on reverse flap cancelled BOMBAY GPO with light circular PASSED CENSOR/22/BOMBAY h/s on front with scarce violet VIA MOHAMERAH instructional handstamp applied and ISFAHAN No.4 arrival cds. INDIA - 1902 1/2a green PSE to Karachi used at EXPERIMENTAL P.O./B-269. H&G 8. 1902 1/2a green on cream postal stationery envelope (size C) addressed to Karachi and bearing additional 1/2a adhesive tied by s/r EXPERIMENTAL P.O./B-269 cds dated 9.MA.22. H&G 8. 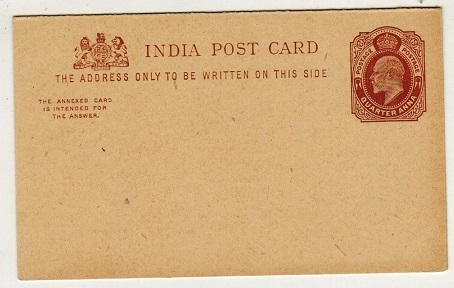 INDIA - 1905 1a rate postcard to UK used at EXPERIMENTAL P.O./M-1177. 1905 (AU.9.) use of picture postcard addressed to UK depicting 'Elephant and Trainer' bearing 1a adhesive tied by barred 'M' duplex with EXPERIMENTAL/M-1177 cds alongside and BOMBAY/F transit. INDIA - 1879 1/4 a red-brown PSC to Bombay with 'K4/T/20-K' railway strike. 1879 Quarter Anna red-brown on cream 'East India' postal stationery postcard addressed to Bombay cancelled by barred 'T' strike with scarce' K4/T/20-K. UP' railway cancel at left dated 20th November and with R/BOMBAY/DELY arrival on Nov 24th. H&G 1. INDIA - 1943 'OAS' NOT TO BE TAXED handstamped stampless cover to UK. 1943 (AUG.6.) 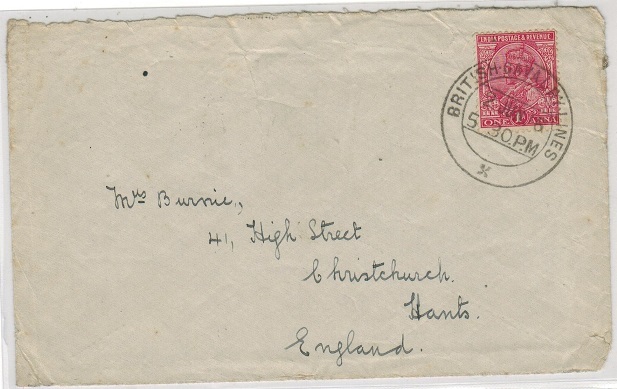 stampless cover addressed to UK marked 'K.B.B.ON ACTIVE SERVICE' and struck by violet two lined ON ACTIVE SERVICE/NOT TO BE TAXED handstamp. Censored my violet circular UNIT CENSOR/F5/INDIA strike with FPO/No.72 b/s. Troops at Trichinopoly. INDIA - 1896 1a rate 'Soldiers Letter' to UK used at MEERUT. 1896 1a rate 'Soldiers' letter addressed to UK cancelled by MEERUT/Y cds and marked 'From Gr.W. Cambill. 34th Field. B.R.A.' and counter signed at lower left by the officer commanding. 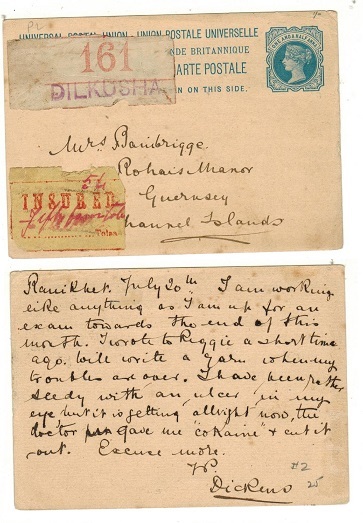 INDIA - 1892 9 pies rate 'Soldiers Letter' to UK used at KARACHI CAMP. 1892 (OC.12.) 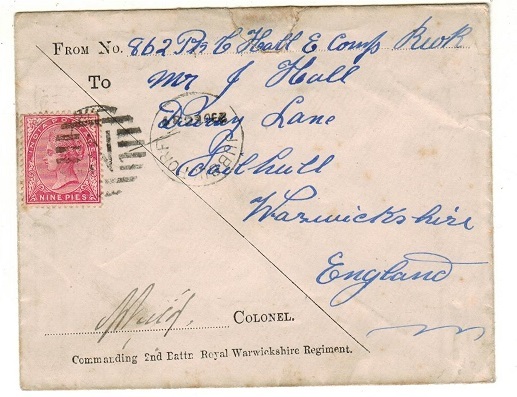 9p rate 'Soldiers' letter addressed to UK headed by a Corporal of the 47th Field Battery R.A. and counter signed at lower left by its Major. 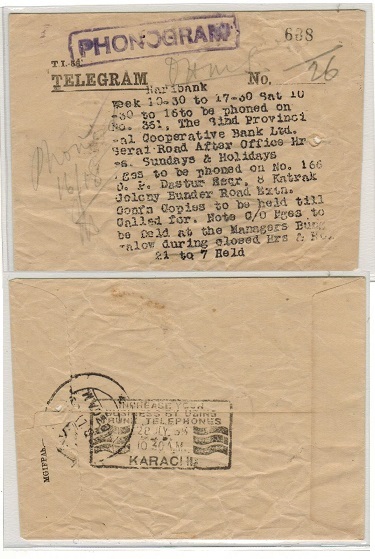 Cancelled by squared circle KARACHI CAMP/3 cds with SEA POST OFFICE/C transit b/s. 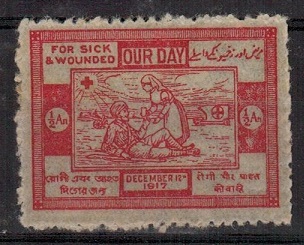 INDIA - 1917 1/2a red 'FOR SICK AND WOUNDED' red cross label mint. 1917 1/2a red 'For Sick & Wounded/Our Day/December 1917' RED CROSS label on gummed perforated paper. 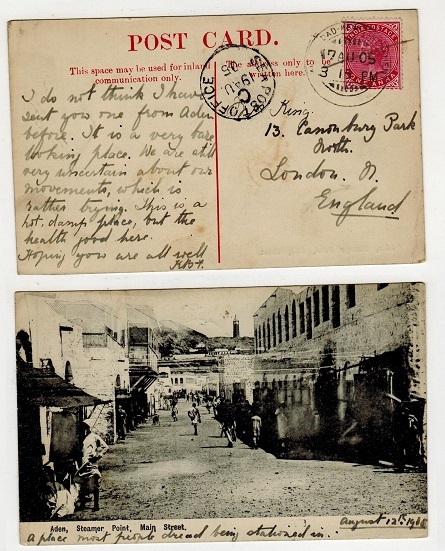 INDIA - 1911 1a rate postcard use to UK used at ARMY HEADQUARTERS/SIMLA. 1911 (FE.9.) 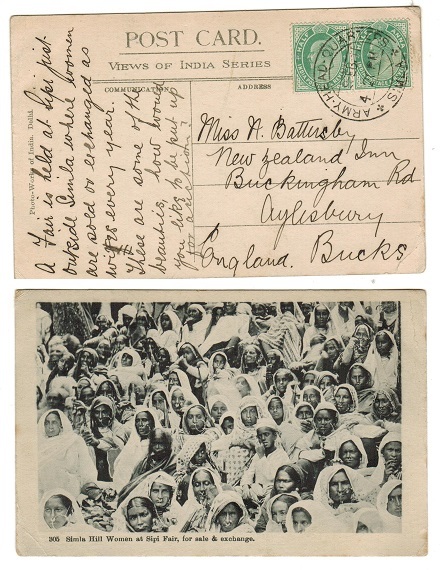 use of picture postcard addressed to UK depicting 'Simla Hill Women at Sipi Fair' bearing 1/2a pair tied by scarce ARMY HEAD QUARTERS/SIMLA cds. INDIA - 1909 1a rate postcard to Ireland used at DIKOM with TOO LATE h/s applied. 1909 (NO.8.) 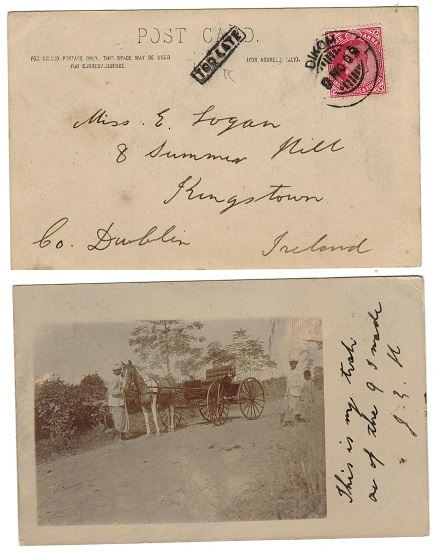 use of real photo postcard depicting 'horse and trap' addressed to Ireland and bearing 1a tied DIKOM with black boxed TOO LATE handstamp at left. 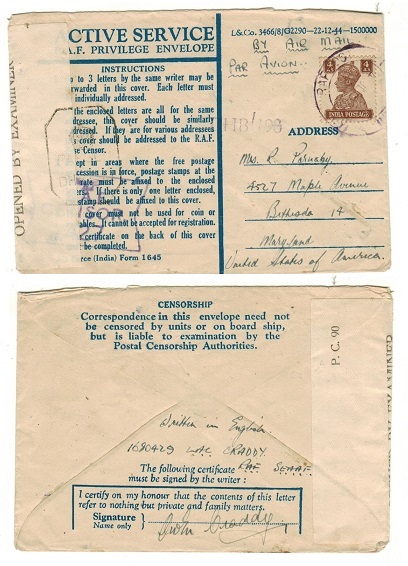 INDIA - 1945 'FPO/99' censor cover to Bombay. 1945 (MAR.29.) 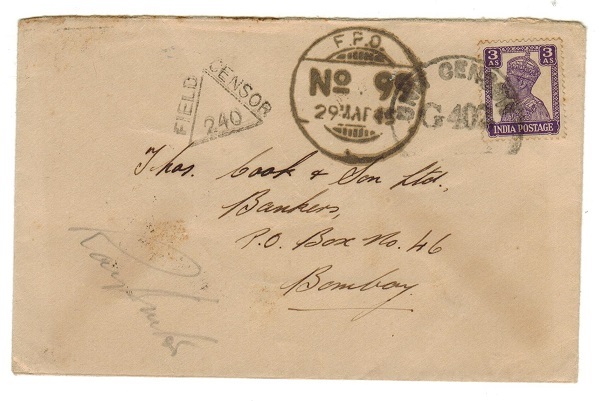 cover addressed to Bombay bearing 3as violet adhesive tied by circular UNIT CENSOR/G402 h/s with F.P.O./No.99 cancel alongside used by Indian troops at Nasik. INDIA (Pondicherry) - 1903 postcard to France used at PONDICHERRY. 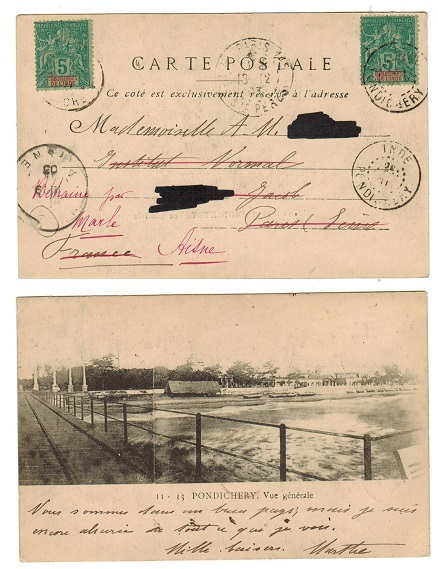 1903 use of picture postcard addressed to France depicting 'Pondicherry-Vue Generale' bearing two examples of the Frence 'Etabissements De L'Inde' 5c adhesives each cancelled by d/r INDE/PONDICHERRY cds's. 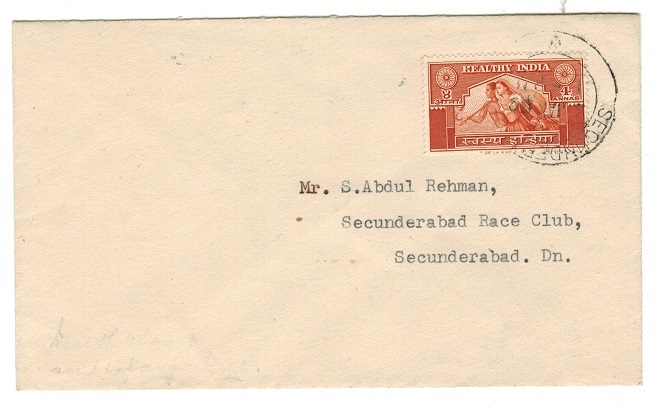 INDIA (Afghanistan) - 1926 combination cover used at LANDIKHANA. 1926 (SEP.8.) 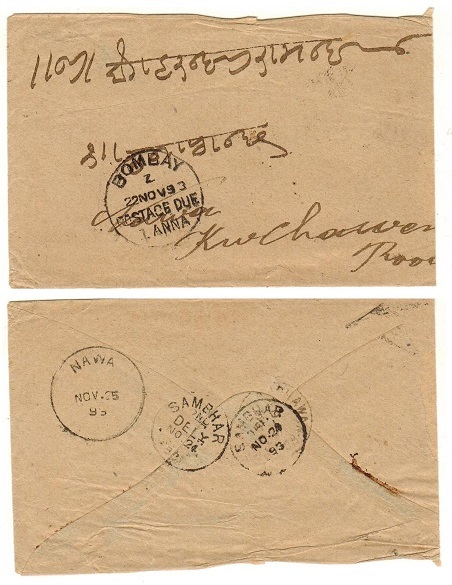 cover addressed in local script bearing Indian 1a adhesive tied by LANDIKHANA cds and tied in combination with Afghanistan local by oval local strike. A nice combination cover. INDIA - 1914 LUCKNOW/UNPAID taxed postcard. 1914 (NO.22.) use of picture postcard addressed locallty bearing Edward VII 3p grey tied NULLAH and with LUCKNOW arrival cds at left. 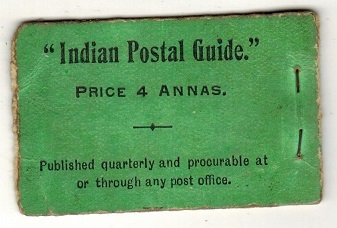 The card was underpaid and has both green oval LUCKNOW/ UNPAID h/s applied and boxed POSTAGE DUE/HALF ANNA strike. INDIA - 1953 TRUSHIPPALLI/AIRPORT/T taxed cover to Ceylon. 1953 (AU.1.) cover addressed to Ceylon bearing 1a (x3) tied by TEAKULAM cds's with black boxed AMOUNT TO BE/COLLECTED…… instructional h/s added with '6cts' inserted in manuscript and scarce circular TRUSHIPPALLI/AIRPORT/T tax marking at left. INDIA - 1931 'Inauguration Of Delhi' short set to 3a on cover to USA. 1931 (MAY.5.) 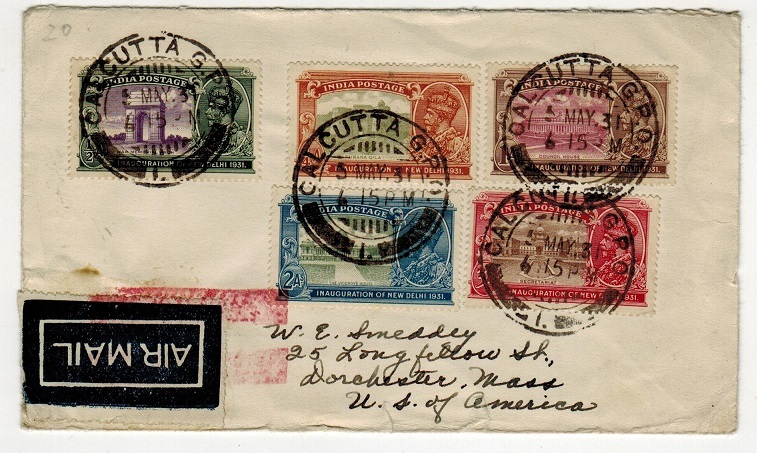 cover addressed to USA bearing the 'Inauguration Of New Delhi' short series to the 3a (SG 226-230) tied by CALCUTTA G.P.O./1 cds's with blue on white AIR MAIL label at lower left struck through by two red transmission bars.